The gite is a converted stone-built barn with it's own private parking and fully enclosed terrace and entrance courtyard. It is situated on the southern edge of the small village of Bouisse, which boasts around 55 permanent inhabitants and has it's own château and medieval church. Just on the outskirts there are 3 small lakes with picnic tables and a play area. The lake is stocked with trout and carp and fishing permits are available in season. We are south of Carcassonne and east of Limoux, a town famous for it's sparkling wine, Blanquette de Limoux. Bouisse is surrounded by beautiful hills and pastures where the cows and sheep graze peacefully. Wonderful views of the snow- capped Pyrénées mountains. Numerous walks from the village possible and also cycling on and off-road. We offer evening meals in our guest house, using locally sourced produce where possible and our organically grown vegetables are from our garden. Packed lunches are also available on request. We highly recommend that you visit our website at . On the ground floor are 2 bedrooms with double beds. Mezzanine, the bedroom has 2 single beds. A baby cot and highchair are provided and the stairs are fitted with a stair gate. The bedrooms have electric heating. The bathroom has a shower and a heated towel rail. The living/dining area has a TV/DVD/CD player and oil fired stove. The modern kitchen is fully equipped with an oven/hob, dishwasher, microwave, fridge/freezer, toaster, kettle, coffee-maker and is well stocked with crockery, cutlery and all the usual utensils. Tea towels and all bed-linen are provided. A cleaning service is available if required. We have lived here in our ex farmhouse since buying the property including the gite in 2004. We have renovated the gite and fully equipped it for our holiday guests. We are always on site and are available at any time for any queries our guests may have. We can recommend some of the beautiful attractions that are easily reached from our village. If you want a relaxing restful holiday, whether it is spent relaxing by the pool or visiting some of the many nearby attractions, this is the place to be. If required we can provide bathroom towels, but we recommend that you bring towels for use at the pool. Sofa and chairs for comfortable relaxing. Fully equipped kitchen with microwave and dishwasher, fridge freezer. Large garden for children to play in safety. There are a number of centres nearby for water based activities. Fully enclosed private terrace at the gite. There are golf courses at Carcassonne, Narbonne and Perpignan. The pool is shared with guests staying in our b&b only. This occurs rarely. Notes on accommodation: The guest house is fully central heated, and our large comfortable lounge is also fitted with a log-burning fire for those cooler winter evenings. A TV, DVD player is at your disposal with satellite TV. Off-road parking is provided for our house guests. Baby cot and highchair and stairgate. Cleaning service available for gîte 30 euros. 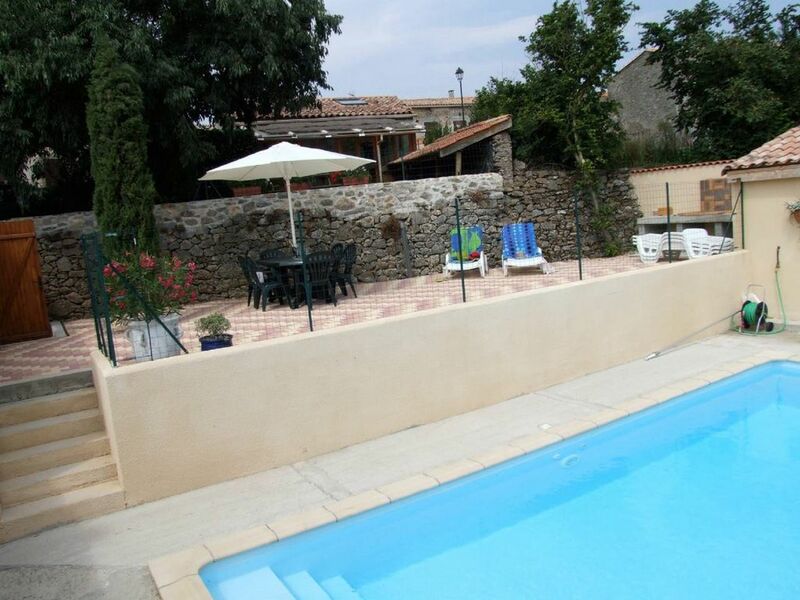 Outside: The gite has it's own secluded terrace which has garden furniture and a BBQ overlooks the 4x8m pool which is fully enclosed and with a lockable gate. The pool also has a security alarm. There is also a separate sunbathing terrace next to the pool with 6 sun loungers. The pool is shared only with any guests we may have staying in the guesthouse. We have a 1 acre garden where children can play safely, and also a table tennis table. The pool is usually open from May to October. Hosts are very helpful and friendly. Really enjoyed our 4 day stay. Good self guided hiking and nice pool. Lieu très agréable avec un accueil tout aussi agréable.je recommande ce lieu . Maria et paul on prit soin de nous pendant notre séjour. Le lieu est très agréable avec piscine et pour ceux qui le souhaite un vrai rapprochement avec la nature . Narbonne and Perpignan are about 70km drive, with some pretty surrounding villages, fishing ports and sandy beaches. Carcassonne airport is just under an hours drive away. Perpignan and Bezier airports are 1¼ hour’s drive. All 3 airports are served by Ryanair direct from many UK airports. Toulouse International airport is 2 hours drive away as is Montpellier. If flying here, a hire car is essential and the airports have offices on-site. For group bookings, airport transfers are available. Calais and Boulogne Ferry ports are 1100km. Caen is 887km. Santander 636km. Good motorway links through France. The medieval city of Carcassonne is an hour’s drive and Limoux is 30 mins away. The abbeys of St. Hilaire and Lagrasse are about 45 mins away. There are numerous Cathar Castles within easy reach of the village, ranging from 15 mins to around an hours drive away.The lovely town of Mirepoix about 1¼ hour away and has a huge market every Monday. The town of Limoux is the nearest town, and has a number of supermarkets, banks and restaurants. It also has canoe and kayak centres based on the River Aude. There are a number of restaurants all within a half an hours drive of Bouisse, offering a complete range of cuisine, from pizza to full à la carte regional menus. The village also has daily deliveries of bread. The grocer visits twice a week and the fishmonger; butcher and greengrocer come once a week. There are markets every day of the week in nearby towns and villages. Horse riding is available nearby. In the same village, there are tennis courts which can be booked for you. Cathar Castles are all within easy reach and are too numerous to mention. The hilltop village of Rennes-le-château, which features in the Da Vinci Code is well worth a visit. A day trip to Spain or Andorra is possible. Booking Notes: When booking, 25% deposit is required, which will secure your stay. The remaining balance is due 8 weeks prior to your arrival. Payment can be by cheque or directly into our UK bank account. A receipt will be sent to you. Holiday insurance is recommended. Changeover Day: Changeover day for the gite is Saturday. This may be more flexible out-of-season and for group bookings. Weekends are available in the gite, out of season. The cottage is available from 4pm on the day of arrival and must be vacated by 10am.